How Can Webinars Improve Your Business? Webinars have seen a great surge in popularity in recent years thanks to the ease of hosting and attending them, and many industries now rely on this medium to communicate with other industry leaders and even reach more customers. In fact, there are many ways in which hosting and co-hosting webinars can help you build your business. In many ways, your database of prospective clients and customers is your most powerful business asset: the larger the list of people you know, people who trust you or your brand, and people who are fans of your work, the better off your business will be. Hosting free webinars is a great way to attract new people to your brand. Be sure to promote the event through various social media networks or consider co-hosting with another popular industry figure in order to gain access to their following as well! The more people who know about your brand and what it does, the more likely you are to sell your product or services. Getting your name out there into people’s minds should be one of your top priorities, especially with a new business. Even the simple act of speaking as part of a webinar that you are not hosting can be a great way to expose new people to your ideas, products, or services! Each and every time you get up in front of a crowd to talk about what you do or new developments in your industry, you have the opportunity to practice and improve your speaking and presentation skills. Record your webinars and return to them later to see which areas can be improved upon next time. Many companies that have made a habit of hosting useful industry webinars have seen great success and large increases to their sales thanks to this exposure. 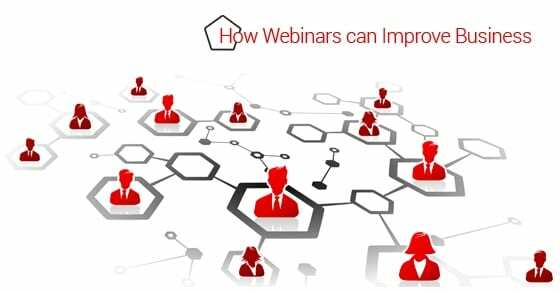 A primary source of lead generation, webinars are an easy way to connect with potential customers and offer them real value that is more likely to have them convert. Webinars are also a great way to connect with the decision makers at other companies who might benefit from your service or products. By building brand awareness and a solid reputation as an expert in the field, you will be setting yourself up for making real connections with important industry contacts. Joint venture webinars are collaborative efforts between multiple industry leaders and can be a great way to share lists and networks with each other, increasing the reach of both companies. Webinars are also becoming increasingly popular in online training initiatives.